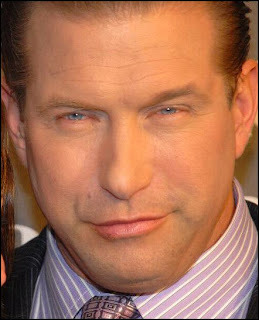 Time has not been good to Friend of the Blog Stephen Baldwin. Once the star of such films as The Usual Suspects and Bio-Dome, this actor's career has taken a nosedive, resembling Danny DeVito standing next to "twin" Arnold Schwarzenegger when compared to his brother Alec's return to critical acclaim. When we last checked in with Stephen, he was hosting a July 4th Tea Party and encouraging as many as 12 Americans (not pictured) — who looked like they got lost on the way to buy tickets to Spamalot! — to protest Barack Obama's tax policy, which unfairly penalizes people like Mr. Baldwin to the benefit of the people surrounding him. Actor Stephen Baldwin, brother of Emmy winner and "30 Rock" star Alec Baldwin, filed for bankruptcy in New York on Tuesday, according to a court document that says he is millions in debt. The 43-year-old actor filed for Chapter 11 protection claiming he owes more than $2.3 million and owns a New York property valued at only $1.1 million. Baldwin... owes about $1.2 million on two mortgages on the New York property and more than $1 million in taxes. He also has credit card debt, court papers showed. New York newspaper Newsday reported earlier this month that a homeless man who was allowed to live on Baldwin's property was arrested on heroin charges and suspected of dealing drugs. Police told the newspaper that Baldwin, who has described himself as a born-again Christian, was shocked and just trying to do a good deed. While the latter two paragraphs might, to a salacious mind, explain why the man looks like sweating dogshit during public appearances lately, the purposes behind those public appearances are neatly explained in paragraph number three. After all, if most of us had a million-dollar tax bill, we too might be up in arms about the Obama tax increase on the wealthiest Americans (although we might be less disingenuous about claiming our crusade was for the good of the middle class). Big income tax troubles are also evident from the court filing, with $749,974 owed to the IRS on taxes as far back as 1999 and a $139,288 debt for unpaid withholding taxes, as well as $194,527 in unpaid state income taxes. The youngest of the acting Baldwin brothers also has more than $70,000 in credit card debt to shake, according to court documents. As if his failure to pay taxes and its contradiction of his born-again Christianity's injunction to render unto Caesar and also to tend to the poor and downtrodden weren't enough, a decade of not bothering to pay taxes while racking up massive debt is a real bummer of a blow to his newfound calling as a representative of the party of fiscal restraint, fiscal responsibility and balanced budgets. Stephen's sort of out of his sort-of job. What does this tell us about Baldwin and about his future? First of all, despite all previous evidence to the contrary, Baldwin legitimately seems better at staying in character while acting than in real life. If you read through the script even once, that means that from then on messy things like facts won't get in the way of staying on message: you know what's to come and what to do. The process brings fewer pitfalls than real life. More importantly, though, these circumstances tells us he's going to need to get back in front of the camera ASAP. My suggestion? One word: sequel. The end of Sharks in Venice left me (and perhaps dozens of others) with an empty feeling, an inchoate sense, a wonder about what came next. Now is the time to provide that answer to adoring fans. I ask you to watch this and tell me, can there be any doubt that this is what moviegoers would want more of? To rescue himself and his station as a speaker for the Republican Party, Stephen must become again what he was born to be: actor, thespian, man-god. America will thank me. And you.